"Huge-ish" would be the best way to put it. Donald Trump as host of "Saturday Night Live" brought in an average of 9.3 million viewers on Saturday for NBC's long-time comedy show. This makes Trump's November 7 appearance the most-watched "SNL" episode since December 2013, which was hosted by Jimmy Fallon and brought in an average of 9.4 million viewers. The show usually averages 5 to 6 million viewers. Trump was also a hit with those aged 18 to 49 years old, averaging a 2.3 rating in the prized advertising demographic. The presidential candidate's appearance was highly anticipated going into the show not just for the brash nature of Trump, but also for the controversy that surrounded his appearance. Some Latino groups were angered over Trump's appearance due to the candidate's comments regarding Mexican immigrants and protested on Saturday. The reviews of Trump's performance on "SNL" were mixed with some finding Trump funny in sketches like his parody of the Drake music video, "Hotline Bling," and others finding the episode "toothless." 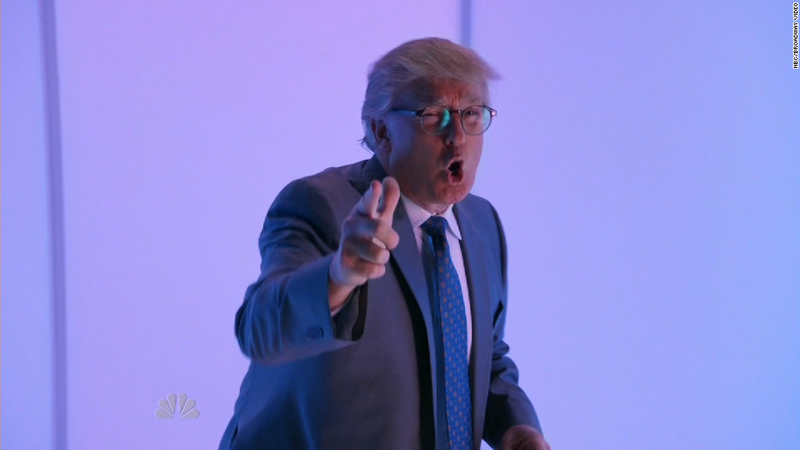 Since the appearance, NBC has released online a cut-for-time sketch that involved Trump's hair and had the "SNL" cast playing "Scalp Team 6." The released clip was panned by some on the internet like The Daily Beast's Matt Wilstein. "For some reason, NBC decided to release this video, simply titled 'Donald Trump's Hair,'" Wilstein wrote. "Perhaps so the world could see that things could have been so much worse."